A few weeks ago, I got together with the most awesome group of women ever assembled for a long weekend on a lake. You should do this every so often with your friends, it’s great. We cooked good food, made good cocktails, watched The Golden Girls, colored pages from this coloring book, and even had an informal book club. Friends who read are the best friends. 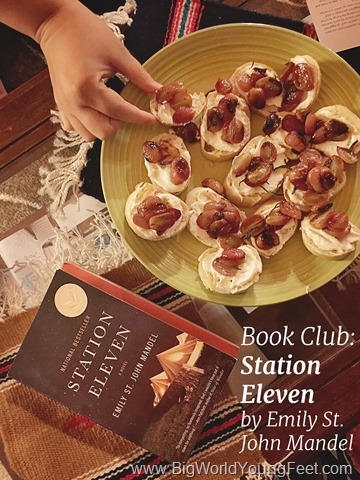 Station Eleven is a good book club book. A flu has ravaged the globe, and most of the population is dead. What remains are small communities of survivors; what links them together is the Traveling Symphony, who puts on Shakespeare and plays music for each town they visit. Of course there’s a deranged cult leader to provide the novel’s drama. There are plenty of flashbacks to provide characters’ back stories, link characters and plotlines together, and of course remind you just how terrible things are if there’s no electricity. It has broad appeal—both those in the post-apocalyptic Walking Dead camp and those who like more traditional literary fiction reads will enjoy this one. Our discussion of this book was pretty informal, so I don’t want to recap our discussion of it. Instead, I’ll give you some of the questions we asked in case you’re looking for some discussion starters with your own book club. Who did you not like? What are the differences between the generation born after the flu and those who lived in the world before it? How does this novel compare to other post-disaster or post-apocalyptic stories you’ve read or watched? How does it differ? Why was the graphic novel, Dr. Eleven, such an integral part of the novel? What do you think of Arthur Leander’s character arc? How are relationships different after the flu? What would you contribute to the Museum of Civilization? Why do you think cults and leaders like The Prophet are so common? How do history and memory work in the novel? What do you think about the new city introduced at the end of the novel? Particular scenes or relationships that might be fun to explore more: Arthur and Clark, Jeevan and Frank, Jeevan realizing for the first time how serious the flu is going to be, the Air Gradia jet, finding the untouched house. What’s your Book Club reading? Have you read Station Eleven? What are your thoughts on it?